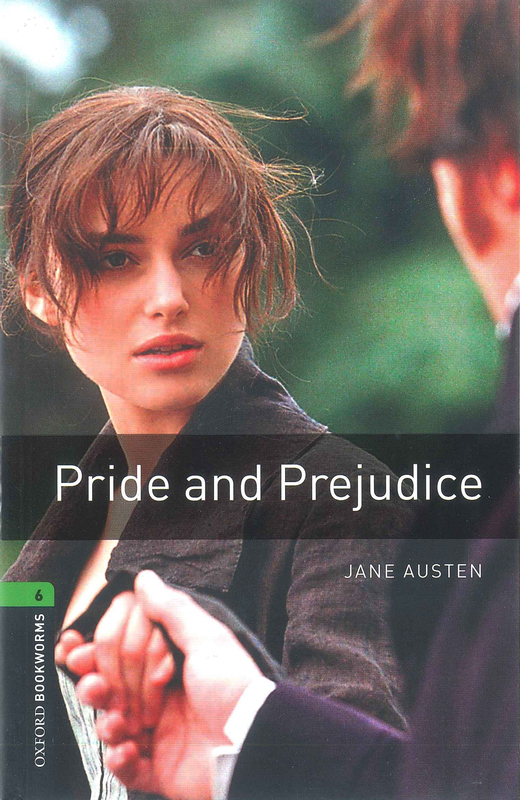 The edition of Pride and Prejudice, on which the cover shows an image of the well-known actress Keira Knightley from the 2005 film adaptation, indicates that Austen’s novel has not gone out of style. The cover speaks to the market of younger readers who have come to the abridged, Oxford Bookworms version of the novel via the film, illuminating Austen’s adaptability and the timeless qualities of her work. Austen, Jane. Pride and Prejudice. Oxford Bookworms Library. Oxford University Press, 2007. This edition’s cover indicates that Austen’s novel is about a strong female lead in love, as it displays an image of Knightley, who plays Elizabeth Bennett in the Universal Studio’s adaptation of Pride and Prejudice, holding the hand of a man whose blurred back is turned away from the camera. This implication, given by the image on the cover, reflects Austen’s portrayal of Elizabeth Bennett, who is presented in the novel as a sharp-witted, headstrong woman who intends to fall in love on her own terms. These qualities are reflected particularly well in her rejection of Mr. Collin’s proposal, to which she states, after having already refused him once, “I do assure you that I am not one of those young ladies (if such young ladies there are) who are so daring as to risk their happiness on the chance of being asked a second time. I am perfectly serious in my refusal. You could not make me happy…” (Austen 77). These attributes, unique to what would be considered proper for a female of Austen’s time, are reconfirmed in her initial rejection of Mr. Darcy’s proposal and later, upon further reflection on his morals and her feelings for him, her acceptance of his proposal against the wishes of Lady Catherine. The cover image of Knightly staring confidently at the blurred man whose hand she is holding, presumably Darcy’s, reflects Elizabeth’s attributes well, thus conveying the enduring qualities and intentions of Austen’s work. Since this particular cover speaks to an audience of younger readers who have come to the novel via the film, the image of Keira Knightley is used as a marketing technique. A modern audience will be familiar with Knightley, thus her face on the cover of the book works to draw in the contemporary audience that may have seen the film. In “From Cover to Cover: Packaging Jane Austen from Egerton to Kindle,” Deirdre Gilbert asserts that, from 1995 when the BBC aired Pride and Prejudice, “a spate of celebrities, speaking to the reader who associates the film and text, has turned up on Austen covers” (12). Keira Knightley’s performance in the 2005 adaptation is a primary example of this, as her celebrity status draws attention to Austen’s work in both the film and on the cover of the book, allowing Austen’s work to remain timeless. Aside from the image of Knightley, the front cover is minimalistic. It presents the title, Pride and Prejudice, and the author, Jane Austen. Both the front and back cover state that the book is a stage 6 classic from the Oxford Bookworms Library, advertising this version of the novel to a younger audience. This is a smart marketing tactic, paired with the image of Knightley, as the film becomes a gateway to this abridged edition of Austen’s work. The back cover also includes the following quotation from Elizabeth Bennett in the novel: “The moment I first met you, I noticed your pride, your sense of superiority, and your selfish distain for the feelings of others. You are the last man in the world whom I could ever be persuaded to marry.” This quotation reinforces Elizabeth as a strong female lead who intends to marry for her own happiness. Gilbert states that “…advertising on the back cover evolved over the years from publishers’ promotions to commercial advertisements” (4)—this edition of Pride and Prejudice successfully endorses this abridged version of the novel for a younger audience who has seen the 2005 film adaptation while conveying Austen’s work well. 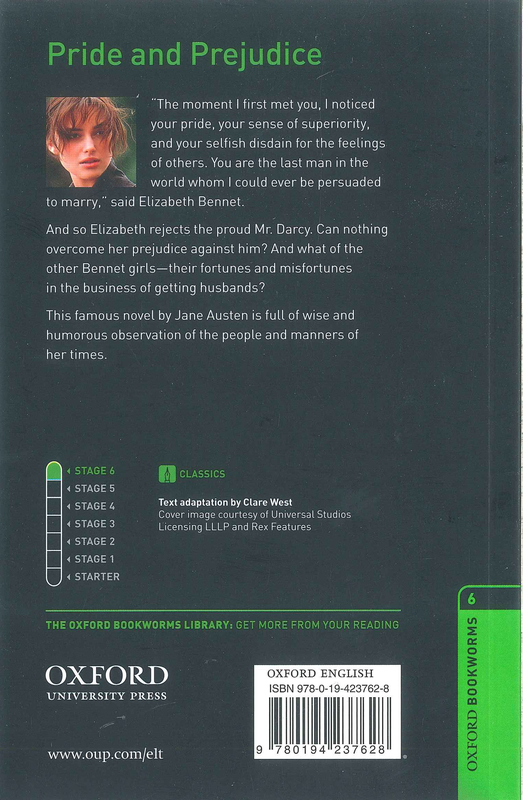 This edition of Pride and Prejudice speaks to both the marketing techniques of Austen’s novels and an understanding of her work. This cover “completes its text, giving it a voice that another cover would alter” (Gilbert 14). The image of Keira Knightley presents Elizabeth Bennett as the strong female lead that Austen intended her to be, conveying the message that Elizabeth is determined to marry for her own happiness, not on the basis of wealth or others’ wishes. This abridged edition is well marketed, with the intentions of attracting a younger audience who has come to the novel via the film. Criticism. W. W. Norton & Company, 2016.